The skeletal remains of two infants were found underneath a rural Texas trailer, police said Monday, in the same area where another set of infant remains was found last year. Authorities were called about 3:30 p.m. Sunday to the trailer south of Kennedale, about 15 miles southeast of Fort Worth, Texas, in rural Tarrant County, said Terry Grisham, spokesman for the Tarrant County Sheriff’s Office. There is a group of about five mobile homes there, he said, that are leased by the property owner. 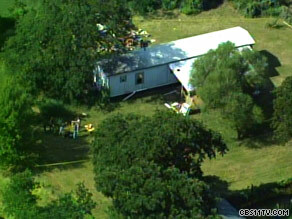 One of the mobile homes had recently become vacant, and the owner was cleaning it up, Grisham said. The owner pulled back the metal “skirt” around the bottom of the mobile home and was “digging around in there,” and found a plastic bag, Grisham said. When the man opened it up, he found a box, and inside the box he found the “bones of a very young infant,” Grisham told CNN. He continued to look, and found another plastic container with more remains inside, of a “similar-aged infant,” before calling 911, Grisham said. In 2008, the same man called police to report that he had found a suitcase in the same area, in an overgrown field a distance away from the mobile homes, while dumping leaves. When he used a knife to cut into the suitcase, a set of infant bones were found, Grisham said. The medical examiner’s office was unable to determine a cause of death because the remains were skeletal, although no bones were broken, he said. “We worked the thing as best we could, without any more to go on than we had,” but the investigation stalled, Grisham said. Police have contacted the two people — a brother and sister — who recently moved out of the trailer, he said. The two have been cooperative with authorities, he said. They were interviewed separately, but both told police they had no idea the remains were there, Grisham said. Authorities and the medical examiner’s office remained at the scene Monday, Grisham said, and plan to use cadaver dogs at the site Monday afternoon in an effort to determine whether more remains were present. “This ground is pretty brushy and overgrown,” he said. A county work crew was brought in to carefully cut down the brush to aid the search, he said.